This product treats only bacterial infections. It will not work for viral infections (e.g., common cold, flu). Unnecessary use or misuse of any antibiotic can lead to its decreased effectiveness. Take this medication by mouth 4 times daily (after meals and at bedtime) for 10 days. Take each dose (3 capsules) with a full glass of water (8 ounces or 240 milliliters) unless your doctor directs you otherwise. Swallow the capsules whole. Do not crush or chew the capsules. Do not lie down for 10 minutes after taking this medication. What conditions does Pylera treat? Tell your doctor right away if any of these unlikely but serious side effects occur: numbness/tingling of arms/legs, discolored teeth, mental/mood changes (such as confusion, anxiety, irritability, depression), difficult/painful swallowing, heartburn, fast/pounding heartbeat, ringing in the ears, frequent/painful urination. Tell your doctor right away if any of these rare but very serious side effects occur: severe headache, stiff/painful neck, signs of kidney problems (such as change in the amount of urine), signs of infection (e.g., fever, persistent sore throat), easy bruising/bleeding, dark urine, yellowing eyes/skin, persistent nausea/vomiting, severe stomach/abdominal pain, unusual weakness/tiredness, seizures, chest pain. List Pylera side effects by likelihood and severity. Before using this medication, tell your doctor or pharmacist your medical history, especially of: kidney disease, liver disease, blood disorders, brain/spinal cord disorders (e.g., seizures), trouble swallowing, esophagus problems (e.g., hiatal hernia, reflux disease-GERD). This product may make you dizzy. Alcohol or marijuana can make you more dizzy. Do not drive, use machinery, or do anything that needs alertness until you can do it safely. Talk to your doctor if you are using marijuana. What should I know regarding pregnancy, nursing and administering Pylera to children or the elderly? Some products that may interact with this drug include: retinoid medications (such as acitretin, isotretinoin, tretinoin), strontium, alcohol-containing products (such as cough and cold syrups, aftershave), products containing propylene glycol, atovaquone, digoxin, lithium, lopinavir/ritonavir solution. Does Pylera interact with other medications? Should I avoid certain foods while taking Pylera? Do not flush medications down the toilet or pour them into a drain unless instructed to do so. Properly discard this product when it is expired or no longer needed. Taking outdated tetracycline can result in serious illness. Consult your pharmacist or local waste disposal company for more details about how to safely discard your product.Information last revised July 2017. Copyright(c) 2017 First Databank, Inc. 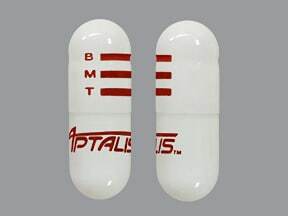 This medicine is a white, oblong, capsule imprinted with "B M T" and "logo". Are you considering switching to Pylera? How long have you been taking Pylera?